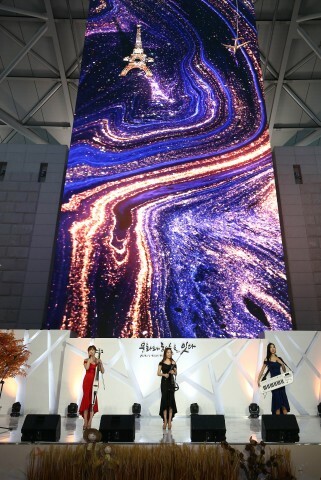 Incheon International Airport is planning to show regular concerts of various genres in Millennium Hall in Terminal 1 in November after its spectacular makeover with an unveiled mega media tower and a newly designed stage. INCHEON--(Korea Newswire) November 21, 2018 -- Incheon International Airport is planning to show regular concerts of various genres in Millennium Hall in Terminal 1 in November after its spectacular makeover with an unveiled mega media tower and a newly designed stage. Terminal 1 in Incheon International Airport presents things to see and enjoy for Airport visitors by showing new performances every month under its slogan “Culture touch the sky”. The regular concerts to be held in November are planned to present passionate performances including popera represented by a beautiful harmony of voices, Korean fusion classical music which is a combination of the charms of the East and the West, and electronic string music mixed with powerful performances that would make you forget about the chilly weather. “Raffine”, a group of electronic string musicians will fire the first shot with a live music performance composed of electronic violin, electronic cello, and shoulder keyboard. Raffine is a group who shows off powerful electric sound and spectacular performances. For the upcoming concert, they are planning to arrange popular movies OST, TV show “Beethoven Virus” soundtrack and “Fuego”, to deliver the fascinating sound of electronic string music. After the powerful electronic performance, a male vocal group “Pasta” will show off their beautiful voices. Pasta, a popera group of four, will present a stage of rich harmonized voices and young emotions based on Italian opera and vocal music. Pasta is composed of a tenor, a base and two baritones and they will arrange various songs for popera such as “Le temps des cathedrals”, a well-known musical number in Korea, “The Goose’s Dream”, a Korean pop song, as well as other pop songs and arias. After the mellow harmony of voices, Korean fusion classical music that delivers charms of the East and the West will be performed. “Gureum (Cloud)”, a group of Korean fusion classical musicians composed of Sori (vocal), pipe, electronic cello, and keyboard will present fascinating Asian melodies by playing folk songs, pop songs, and OST. Incheon Airport has been preparing this stage for contributing to the Incheon community and it is planning to invite excellent artist groups from the Incheon region to present high quality performances. The November regular concerts prepared by Incheon Airport will be held three times a day from November 16 to 30 at 3:30 PM, 4:30 PM, and 5:30 PM in Millennium Hall on the first floor at Terminal 1 in Incheon International Airport. You can find detailed information about the concerts on the Incheon Airport Culture-port website. Incheon Airport is a culture & art airport that invites top artists to perform seasonal regular concerts as well as 365-day regular concerts, and the Airport provides various culture & art programs and facilities including Walk of the Royal Family Parade, Korean Traditional Culture Center, and Museum of Korean Culture.